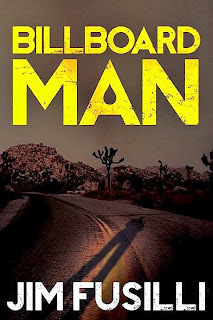 Earlier today, my predominately favorable review of Jim Fusilli’s new novel, Billboard Man (Thomas & Mercer), was posted on the Kirkus Reviews Web site. Click here to read the piece. Prior to penning that critique, I conducted a brief e-mail interview with Fusilli, a New York City resident who, since 2008, has been The Wall Street Journal’s rock and pop music critic. I was curious about a few things having to do with Billboard Man and its 2012 predecessor, Road to Nowhere--both of which feature a traveling-man protagonist known as Sam Jellico (whose real name, revealed in Billboard Man, is Donald Harry Bliss)--and Fusilli was kind enough to answer my questions. At the time, I didn’t know how much of our exchange might make it into the Kirkus article--and as it happens, not much did. So I’ve decided to offer the best portions of that interview below, covering Fusilli’s early fiction, his comeback novel, Narrows Gate, and what’s to be expected from future entries in his new series. J. Kingston Pierce: Between 2001 and 2004, you published a quartet of novels featuring New York writer-turned-private eye Terry Orr, beginning with Closing Time and concluding with Hard, Hard City. But then you conceded in an interview that the P.I.-fiction field wasn’t necessarily the best place for your writing. What is it about the Sam Jellico/Donnie Bliss books that fits better with your desires and expectations as a novelist? Jim Fusilli: I feel I outgrew the first-person narrative style that I used in the first four novels. Or at least I was eager to experiment with craft. I thought I’d put myself in a box and I wanted to do more. I was getting better simply because of the demands of having to do a novel a year. I was watching what Dennis Lehane, George Pelecanos, and Michael Connelly were doing, writers I had a chance to got to know a bit, and I saw they were writers who wrote crime stories, not “crime writers.” I wanted to reposition myself to be a writer first, regardless of genre and even if I loved genre-writing best of all. Also, as you can imagine, I’m influenced deeply by musicians and the ones I admire the most always seem to want to stretch and to challenge themselves. I wanted to hold myself to the same standards I was demanding of musicians I was writing about for the Journal. In the Sam series, the canvas is much broader: the entire U.S. vs. New York City. The stories are populated with people from a variety of backgrounds and geographic locations. Also, I’m using techniques that are popular in high-end TV these days, where I think we’re seeing great writing: fast-cutting from one plot point to another; many characters who contribute to advancing the arc of the story; threads that seem unrelated, yet come together slowly; and others. JKP: What were your inspirations for this new series? If I had to venture a guess, I would say that you were an enthusiastic watcher of drifter-on-the-run-does-good TV shows in your youth--The Fugitive, Run for Your Life, etc.--and have made that genre your own here. But I could certainly be wrong. What’s the truth? JKP: There’s a good deal of subtle humor in Billboard Man. Was that intentional, or is it simply part of the way you compose fiction? And what value do you think humor has in crime and mystery tales? JF: When I stopped writing novels in 2006, I set out to prove to myself, and maybe to the industry, that I could write in different styles and voices; that I was more versatile and maybe a bit more ambitious than I had shown. I wrote many, many short stories, many of which were published, and I found that using humor accelerated action and delineated characters. I know it sounds obvious, but if you can write funny, it’s fun. In Narrows Gate, the novel that changed my career, there are characters who have varying means of expressing humor. That was a breakthrough for me--to be humorous in different ways as a means to create a hierarchy for the characters. I prize wit in people, so I prize in it characters too. My favorite characters are the witty ones. Also, there are several brief comedic bits in Narrows Gate that can work without context. I wanted to see if could write gags. JKP: What were your original expectations of--or concerns about--Sam Jellico, and how well do you think he’s developing in your books? JF: Without giving too much away, I will say that I knew from the beginning that I wanted Sam to evolve. In Billboard Man, for example, he learns a hard lesson about the impropriety of his treatment of women. I hint at this in Road to Nowhere, but it’s explicit in Billboard Man. There’s a scene in Billboard Man in which he’s dressed down, and it’s what he deserved. He’s better for it, but it’s not easy to witness. This required that I write vivid, multidimensional women characters. I was very conscious of that when I created [Billboard Man characters] Ginger, Cotillion, and Lola. They seem real to me in an almost tactile way. The men--Joe Blunt and Boone [Stillwell]--are archetypes, deliberately so. JKP: Sam seems like such a controlled player. Do you really think he’s capable of carrying an extended series? JF: Not as he is in Road to Nowhere. But if you think about his scenes with his late wife, Moira, that are revealed in flashback, you see the kind of man he was and might be again. As I said, in Billboard Man he grows. I think he’s someone worth caring about. He’s a tragic figure. JKP: Are you currently at work on a sequel to Billboard Man? If so, can you say a little about that story’s plot? JF: I always have the next book done by the time the current book is published. It’s my way. Again, it’s one of those things I learned from musicians. When something is done, move on. So the day after a manuscript is finished, I start something new, if only the research and sketching. In Billboard Man, Sam is exposed. His real identity is revealed. The Wall Street powerbroker, Francis Cherry, wants him to come back to New York. In the next book, we find out why and whether he will. Also, there’s a character who appears in the first pages of Road to Nowhere, but who is never heard from for the remainder of that book or in Billboard Man. She’s a major player in the next book, so much so that she could carry the story by herself. There’s a small universe of recurring characters in the first two novels that contribute to the third book. JKP: Perhaps the most interesting relationship in these yarns is that between Sam and his estranged college-student daughter. How do you imagine that relationship progressing? JF: At the heart of this series is the question of whether Sam and his daughter, who he calls Pup, can be a family again--whether they can be repaired or repair each other. Another question: What role will Cherry play in bringing them together or forcing them to remain apart? I see the series as having two end points on the distant horizon: Will Sam seek to avenge his wife’s murder? And will he and Pup reunite? JKP: In the crime/mystery/thriller fiction field--both modern and historical--whose work do you most enjoy reading these days? JF: If you don’t mind, I prefer not to answer that question. I’ve made many friends in the worlds of mystery, crime, and thrillers--it is the most welcoming community, as you know. I always feel I’m slighting someone when I start mentioning writers I enjoy. I will say that when I was studying how to develop characters that emerged organically from setting, I read Daniel Woodrell and Kent Haruf with the same intensity as I read Willa Cather and other great American authors. I don’t know if Haruf is considered a genre writer, but everyone should read him. JKP: Finally, didn’t you tell me not long ago that you’d like to write a sequel to Narrows Gate? What’s the status of that book? JF: I’ve been asked to write a sequel to it, yes. It’s been a challenge. I wrote Narrows Gate as if it were the last novel I’d ever write--I had no idea that it would be published, never mind be successful. Everything I wanted to say about the subject is in that book: the Italian-American experience; the demythologizing of The Godfather myth; the value of loyalty and the meaning of friendship; how we derive our sense of identity; and the price we pay in our struggle to succeed. But as I worked on early drafts, I was pleased to rediscover several characters, particularly Benno and Bell, who are vivid and compelling, at least to me. There’s a suggestion in Narrows Gate of where they can go--and where they can fail. I’ve developed a few new characters who are staring to feel real. Also, Narrows Gate ended in 1946, which is at the precipice of a fascinating period in American history. I think I’ll be all right. I’ve got about 600 pages that are an awful mess, but there’s a story in there. Cool! I like this piece. Thanks for your sharing. Great. Enjoyed the Kirkus piece too.